Anise Star and Anise seed and this essential oil, Aniseed Myrtle are very similar in chemistry and their applications. Anise Star is typically used for her anti-spasmodic and carminative therapeutic properties to relieve dyspepsia, colic and gas and is anti-ulcerogenic.It has also been proven to be sedative and inhibits acetylcholinesterase. Because of the fantastic anti spasmodic properties, we find her to be awesome when dealing with deep respiratory issues. She can relieve the spastic coughs of bronchitis and chest colds. A good friend of ours uses this in her anti asthma blend. 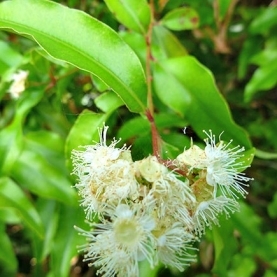 According to Tisserand & Young, Anise Seed Myrtle essential oil can be potentially carcinogenic, based on estragole & safrole content, may inhibit blood clotting & reproductive hormone modulation. Zeck, Robbi. The Blossoming Heart: Aromatherapy for Healing and Transformation. Aroma Tours, 2004.